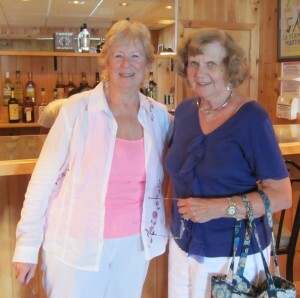 The Women’s Fellowship group of Niccolls Memorial Presbyterian Church in Old Forge hosted their annual Fashions by the Lake Fashion Show luncheon at North Woods Inn on Fourth Lake, on Wednesday, July 17th. Kathy Queen coordinated this year’s event with assistance from Joni Dyer and Alesha Gonyea. This year’s commentator was Kitty Blind. 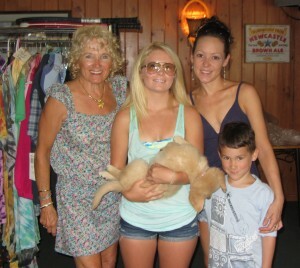 Fashions for the event were provided by local shops and modeled by year round and summer residents. Fashions were provided by Mountain Greenery, Thendara Golf Club, Mountainman Outdoor Supply Co., Just Plain Good, Hollister’s Trading Post and the Old Forge Hardware. Additional fashions were provided by Rainbow Zen, Brown Brothers Factory Store, the Dragonfly Cottage, Pedals and Petals, Enchanted Forest/Water Safari, Ace Hardware, the Woods Inn, Inlet Golf Club, French Louie’s and the ADK Shirt Factory. This year’s theme was Family Fun in the Adirondacks and profits from the event will support bone marrow transplant research. This entry was posted in admin and tagged Dana Armington, Niccolls Church on July 18, 2013 by Dana Armington. 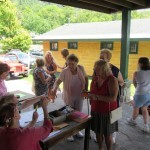 The 62nd Annual Central Adirondack Art Show opened with a reception on Friday, July 5 at View. As part of this year’s show, 99 year old Gerta Wikander was honored for participating in the show for 62 years. 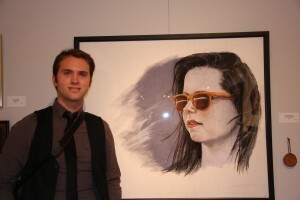 A retrospective of her work is currently on display at View. 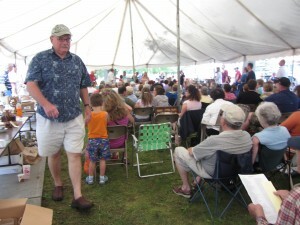 The Town of Webb Historical Association’s annual benefit auction took place on Saturday, July 6 at the Goodsell Museum in Old Forge. For the purpose of implementing an Existing Facilities Program or a FlexTech Program for McCauley Mountain through the NYS Energy Research and Development Authority, the Town of Webb Board passed a resolution in support of the Central Adirondack Partnership for the 21st Century (CAP-21) submitting an application on the town’s behalf. Because McCauley provides thousands of residents and visitors with recreational and economic opportunities, employment, and community activities and events, it was the Board’s belief that these programs would be of assistance to the mountain. Additionally, they cited the need for significant upgrades to the Ski Chalet as well as the snow making equipment to make them more energy efficient, thereby increasing the long-term profitability and sustainability of McCauley. In the FlexTech Program the town would receive a cost-shared analysis of energy efficiency, technical evaluations, improvement analyses, as well as energy master plans. The program would also help with retro commissioning and the development of peak-load curtailment plans of existing facilities. The town would also receive combined heat and power feasibility studies for implementation in McCauley’s facilities. NYSERDA’s Existing Facilities Program will offer the town a broad portfolio of incentives to help offset the costs of implementing energy efficiency improvements. This entry was posted in admin and tagged Cap-21, Dana Armington, McCauley Mountain on July 11, 2013 by Dana Armington. During the monthly meeting of the Town of Webb Board on Tuesday, July 9, the Board passed a resolution in support of CAP-21 submitting an application to the NYS Office of Homes and Community Renewal for the purpose of receiving a Main Street grant for the Old Forge Business District. Nick Rose, executive director of CAP-21 has previously applied for Main Street grants for the town. Though he was successful in securing a grant on behalf of the town a few years ago, the town was not chosen in the most current round of funding. Now that more funding has become available, CAP-21 will apply again. “You have to be in it to win it,” Rose said, in encouraging the town to continue seeking the funds being made available. This entry was posted in admin and tagged Cap-21, Dana Armington on July 11, 2013 by Dana Armington. In collaboration with CAP-21 and the Central Adirondack Association, the Town of Webb Board passed a resolution at their monthly meeting on Tuesday, July 9, supporting the application for a public infrastructure project to reconstruct a water storage facility for the Town of Webb and the Old Forge residential and business district. The resolution came about after the water storage facility had been identified as requiring extensive repair and was deemed insufficient to meet the needs of the town. It is their belief that the availability of a dependable and sufficient water supply system is essential for economic growth and development as well as for the economic revitalization of Old Forge and the Town of Webb. This entry was posted in admin and tagged Dana Armington, water storage project on July 11, 2013 by Dana Armington. The message, which previously warned visitors not to feed big game, now informs folks that a permit is required for transport of firewood. The change is the result of the DEC’s mission to raise awareness about the dangers of trans-locating invasive insects into the Adirondack Park. According to Town of Webb Supervisor Ted Riehle, the sign will be changed periodically throughout the summer to bring attention to various issues such as firewood and the dangers of feeding bear and deer. In New York state it is illegal to transport firewood more than fifty miles. The measure is in accordance with ECL Part 192.5, Firewood Restrictions to Protect Forests from Invasive Species regulation that was put in place on March 18, 2009 and updated on July 3, 2012. According to the regulation, producers, buyers, and dealers are required to have source documentation that explains that the firewood was either heat-treated and kiln-dried, or if firewood has not been treated, documentation that outlines the exact origin of the wood as well as it’s destination and approximate volume. This entry was posted in admin and tagged Dana Armington on July 4, 2013 by Dana Armington.